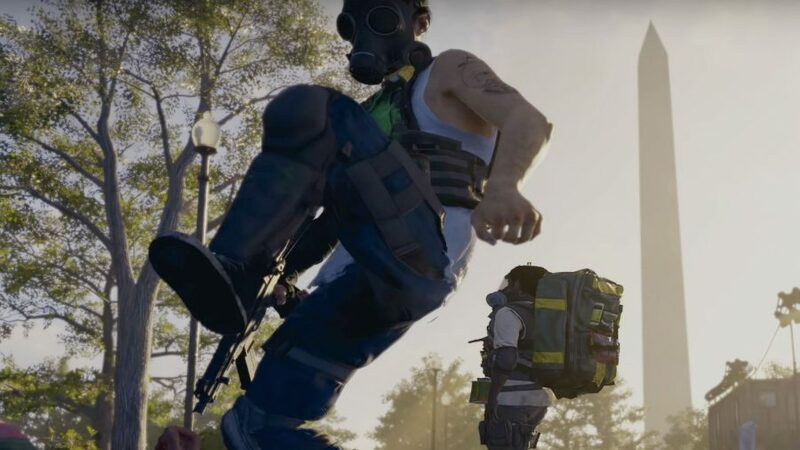 The Division 2 Hyenas faction are a newly revealed group of scavenging raiders that you will face off against while battling across post-apocalyptic Washington, D.C.
For a long time after The Division 2’s reveal in June 2018 the only faction we knew anything about were the True Sons, but a recent story trailer released by Ubisoft sheds light on some of the other groups vying for control of the US capital. The Hyenas featured heavily throughout the reveal trailer and look like they will bring chaos and violence with them wherever they go. So, if you were wondering who would fill in for the Rikers factions from the first The Division game, then look no further than the Hyenas faction. Alternatively, the Hyenas can be compared to the Rioters faction, which suggests they will be low level enemies who make up for their primitive weapons and gear through numbers and sheer aggression. According to Ubisoft, the Hyenas are “a loosely organised gang of opportunistic raiders that prey on struggling civilian encampments through violence and intimidation. These hedonistic scavengers take everything they can steal and destroy everything else to deprive their enemies of valuable resources. The Hyenas are led by a council of the strongest pack leaders.” The Hyenas are also heavy drug users, which explains their erratic behaviour. In the recently released story trailer (watch below) we can spot a few Hyenas enemies. This faction are easy to spot thanks to their fondness for gas masks, ripped jeans, and tank tops. In the story trailer they appear to carry light armour and weapons, with a particular preference for melee weapons like batons, aluminium baseball bats, and submachine guns like the UMP. The Hyenas also appear to wear riot gear over their civilian clothes, making them very easy to identify. There is a heavy variant of the Hyenas that can be spotted early in the trailer. While all of the other Hyenas we see look practically identical, this heavyset chap stands out as a result of his whopping backpack – we can’t quite make out what his weapon is, but it’s certainly larger than an UMP. Finally, the story trailer also gives us our first peek at one of the faction bosses, and judging from all the yellow tape – which also adorns the heavy grunt’s enormous backpack – this heavily armoured, sledgehammer-wielding bruiser belongs to the Hyenas faction, too. While playing against the Hyenas during The Division 2 open beta, we also encountered a few named enemies with special stats and an uncanny ability to eat hundreds of bullets despite no having any armour. It seems like named enemies will play a part in keeping combat varied, which will be important against this early game faction.